The AP Series is an ultra-precise rotary table intended for fine inspection, metrology and test applications. The AP Series has been designed as a “Contact Free” system and eliminates features, which may detract from achieving the optimum rotational performance. The rotating elements are supported on Super High Precision Air Lubricated Hydrostatic Bearings and are not subject to disturbances associated with gear drives. AP Series capabilities delivers new levels of accuracy, flexibility and performance over a wide range of calibration and inspection applications. AP Series utilises Super High Precision Air Lubricated Hydrostatic Bearings which guarantee exceptionally good motion geometry. 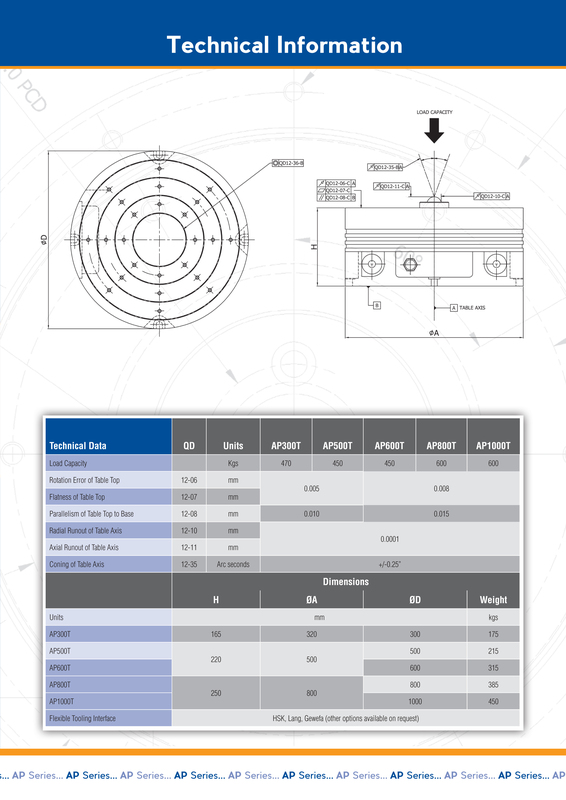 The sub-micron circular geometry and sub-arc second positioning accuracy reduces process measurement uncertainty to a level where the AP Series can be considered your measurement reference standard. The AP Series cleverly designed bearing assembly not only guarantees the highest precision available but a very high load carrying capability. Compatibility allows the AP Series to easily integrate into a wide range of metrology applications. AP Series features have been designed to help you get the job done.